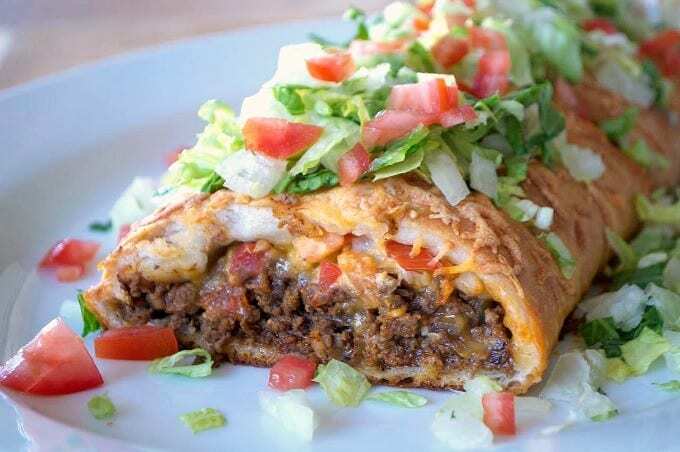 Taco Braid – Super Lean Ground Beef seasoned with taco seasoning, covered with shredded cheese and tomatoes and wrapped in a braided pizza dough. It’s a fun and different way to eat a taco! We’ve all heard of tacos. Whether it’s a regular taco, a fish taco recipe, or any type of taco your heart desires. But, this recipe takes it one step further. Introducing, the taco braid! **This post contains a referral link as well as affiliate links. These links take you to a product (or products) that I recommend. I will receive a credit from any items purchased through those links and your purchases encourage my baking, cooking and butter habit, and contribute to the life of this blog. I thank you so very much for your support. Let’s keep having fun in the kitchen!! 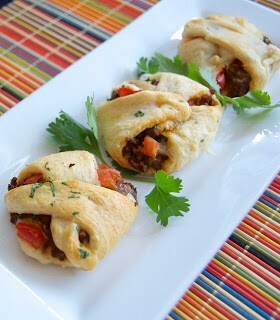 Today I have for you, the illustrious Taco Braid! The video and pictures say it all. You have your meat, cheese, lettuce, tomatoes and the pizza dough. Pretty easy checklist if you ask me! So, here’s your go-to for taco Tuesday. Watch this quick video on how to make it! We eat tacos quite a bit around here because they’re easy and I like to make my own Homemade Taco Seasoning instead of buying the packets at the store. This time, I decided to change things up a bit and do something similar to our favorite Spinach Pepperoni Bread. The braid was super easy to make and delicious to eat, so I’m sure it’s something the whole family will enjoy. Next, use your cut slices into the long sides of the dough, making them 1 1/2 inches thick and 3 inches in. You’ll be placing your ingredients down the middle. Now, fold one end up and take the first two slices and fold them over to hold the end in place. Repeat with the dough slices, folding them over each other until just before you reach the last two at the opposite end. 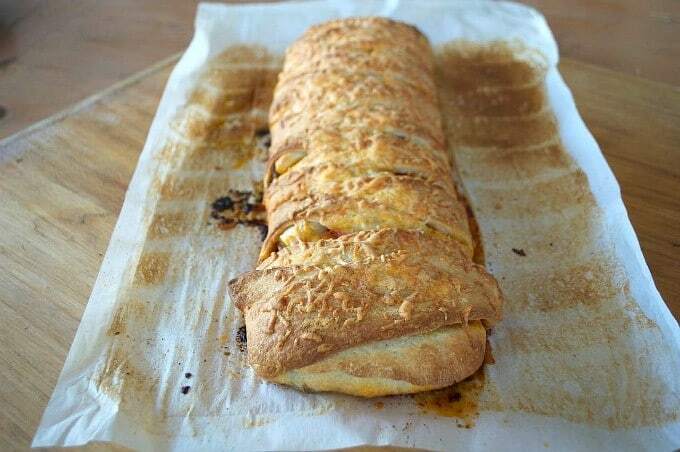 Fold the remaining end up and wrap the last two slices over it. Spread the melted butter over the top and sprinkle with cheese. TA DA!!!! Look at that beauty! Really, don’t be intimidated. Pre-made pizza dough, some really great ingredients and you’ve got yourself a beautiful and delicious dinner. Or, if you want to go a step further you can make your own homemade pizza dough. I think the family will be pleased. 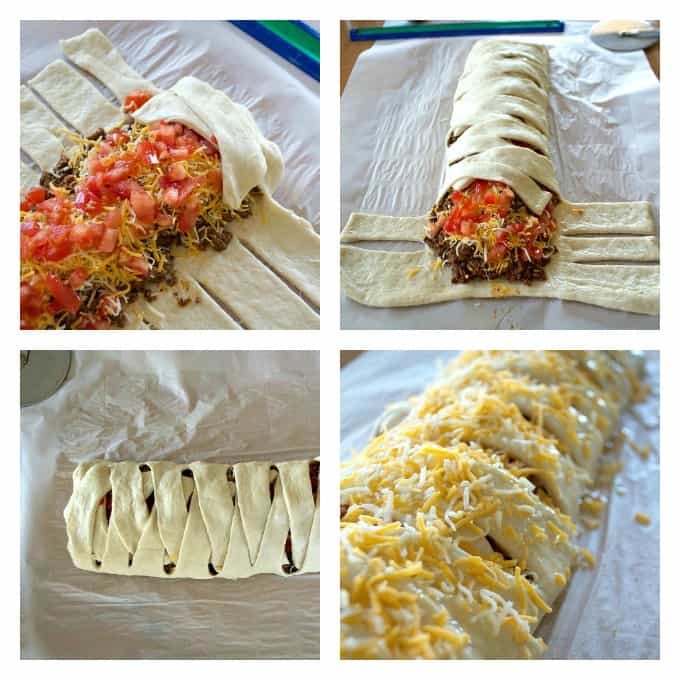 SAVE THIS TACO BRAID TO YOUR FAVORITE PINTEREST BOARD! 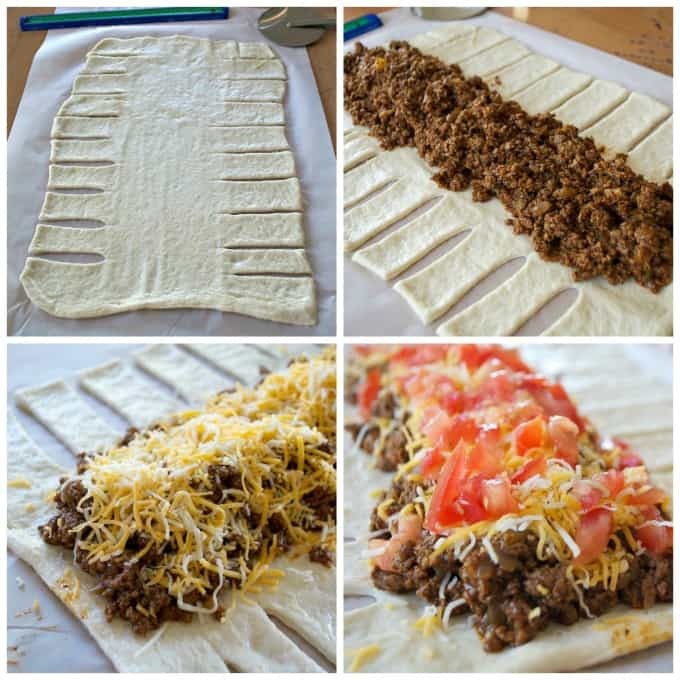 Use these items to make your Taco Braid – my favorite parchment paper, pizza cutter, and basting brush. 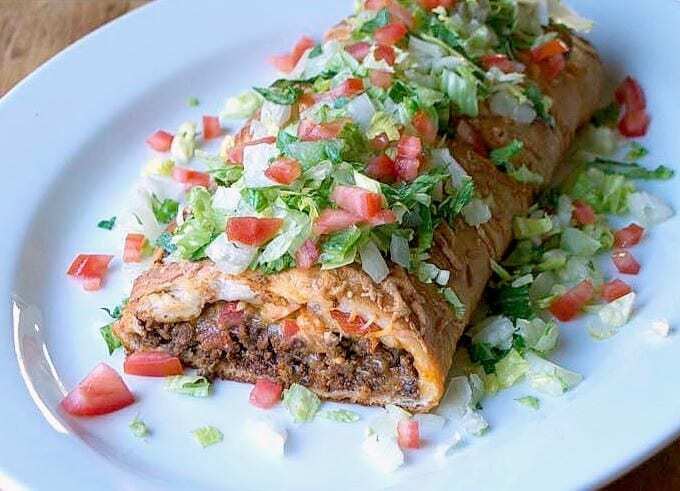 Make this Taco Braid with Zaycon Fresh 93 / 7 Super Lean Ground Beef. 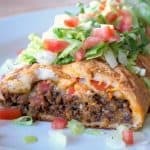 Season it with taco seasoning, cover with shredded cheese and tomatoes and wrap it all up in a braided pizza dough. It’s a fun and different way to eat a taco! Add the chopped onion and cook until soft, about 3 - 5 minutes. Add the Lean Ground Beef and cook until brown. Reduce heat to low and simmer for 5 - 7 minutes. Place the pizza dough on the parchment and roll it so that it measures 10 X 15 - inches. With a pizza cutter, make slices 1 1/2 - inches thick and 3 - inches in along both long sides of the dough. 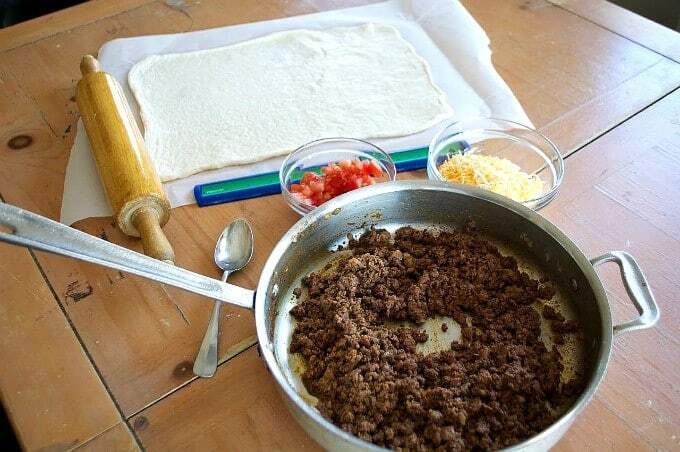 I rate everything I make on a scale of 1 – 4 with 4 being the best and this Taco Braid earned 4 rolling pins. As I said, it was delicious and I really think your family will enjoy it. Mine certainly did. The kids will have fun eating it and it will be a great dish to take to a party. 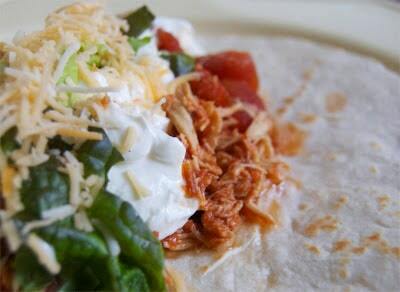 Find out what ingredients make the greatest tacos! Today we went farther up a mountain than we did yesterday, but yesterday was more exciting because we actually saw our first (and hopefully our last) Rattlesnake. We were on that trail behind those houses again with the dog up in front of us. He stopped to check something out in a bush and we heard this strange noise. It sounded like sprinklers to me, but there aren’t any houses built where we were yet, so obviously, it wasn’t that. I hadn’t heard anything like that in the area before, so it was strange. Brady didn’t do anything to it and backed away once again when we yelled to him. I have to say I was pretty impressed and I’d like to chalk it up to that Rattlesnake training he’d had when he was younger. Crisis averted! That stinker was pretty darn difficult to spot. He blended in so nicely with the bushes and desert floor around him, but his rattle was so gosh darn loud. I wish I’d had my camera, but you’ve seen one picture of a Rattlesnake, you’ve seen them all. And like I said, hopefully, we won’t be seeing anymore. Jeanne Klein, I have since then made this braid with a few other variations that were delicious. We did shredded chicken, bell peppers, onions, and alfredo sauce topped with shredded parm. Also we did apple pie filling, walnuts, raisins , cinnamon, and sugar with a drizzle of cream cheese frosting. All great ideas, Jeanne! I’ve got a shredded chicken one I’m planning as well, but that apple pie one sounds especially delicious. Thanks for letting me know! Oh that sounds outstanding with the chicken. I will def have to try it. Thanks for the idea! I’m loving the ground beef in your tacos, Lynne. It’s really mouthwatering. I am hoping that you will not be encountering anymore rattlesnake during your hiking. We made this last night and it was sooo delicious! Definitely a keeper and it would be a great party food. Thanks! Jasmine, that’s so awesome to hear. Thank you so much for your comment! This looks good – wondering if I can assemble, wrap and freeze, then defrost in the fridge overnight and pop in the oven when I get home. Has anyone tried this method? Diane, I have not frozen it before baking, but I know some of my readers have and they’ve said it’s worked ok. If you try it, I’d love to hear your feedback as well! Hi There Lynne~ Thanks so much for an easy fun dinner idea! Do you offset the cuts in the dough on purpose or does it matter much for the braiding/filling containment? Also, a big and GIGANTIC THANK YOU for the link to Zaycon!! I have been talking for years about wishing there was such thing as a meat co-op! Can we say BRILLIANT?!! Yes, I think we can. When I lived in the Northwest I would go in on sides of beef, half a pig etc. with family members. It’s been a very long time since we have been able to take part in anything like that and this is even better.Have already placed my first order, after further research into the company etc., and cannot begin to tell you how thrilled I am-except I think you may be getting the idea:) ~also, I have already raved about and sent it out to everyone I know, which is not the norm for me at all. THAT’S how thrilled I am! 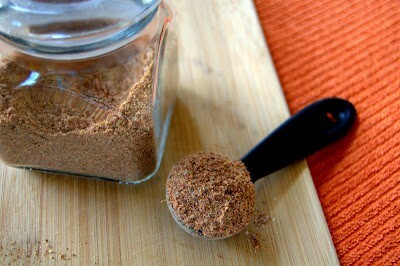 Last, but not least, another thanks for the perfect blend for taco seasoning. I usually just throw together some combination of whatever spices I happen to grab, so having an actual measured guideline of ingredients is awesome. I refuse to pay what they want for the store packets-good grief, they’re ridiculous! Samantha, I am SO excited to read your comment and so sad that it’s taken me so long to respond. I apologize. The cuts of the dough don’t have to be exact, but you do want to try to make them as even as possible so that there won’t be any huge gaps when it’s baking as some filling could tend to spill out. You are very welcome for the Zaycon link. I have been pretty excited about that company as well for the past few years as the products have been great, the prices as well as the convenience. Thanks for spreading the word to your friends, too! I appreciate your comment about the taco seasoning as well. It’s so much easier to have it on hand and know exactly what you’re putting into it as opposed to that store bought stuff. And yes, it IS expensive. I just hate not having one of those packets available when I decide to make a last minute dinner with taco seasoning. Thank you so very much for your comment and taking the time to write. I wish you and your family the very best in 2016! Hugs! Tanalyn, I’ve found that it will serve 4 – 6 people. Thanks so much, Debbie! You must have read my mind, I’ve actually been working on a recipe just like that and will hopefully have it available in an ebook in the next month, so be on the lookout for it! If you make it with sausage, eggs, and cheese…be sure to drizzle some real maple syrup on top of it before you close it up to bake. YUM. That’s a great idea, Doris! Yum is right! I made this tonight… Added red kidney beans and garlic to the meat mixture. It was a hit even with my picky eaters. This will be made again in my house and I even posted it in my Facebook group! Thank you for sharing it! Hope, thank you SO much for letting me know! That’s so awesome to hear and I appreciate you taking the time to leave me a comment. It’s always a plus when we can get our finicky ones to eat. Thanks for sharing it in your group, too! I haven’t cooked or baked in a long long time, and this was the first thing I did and it came out great. Only downside was that I used diced tomatoes out of a can, so they made the bread a bit soggy but otherwise it turned out great. Will definitely make it again. Now I’m just looking over the rest of your site for other recipes to try out on my family. I used to bake and cook when I was younger and loved it, but now with 3 kids, work, etc. it’s hard to find the time. My wife usually does the cooking (and does it well) so it’s a nice break for her. Steve!!! That’s SO awesome to hear and precisely why I now do what I do and I LOVE that you left a comment. THANK YOU! Browse away, I have plenty of recipes to try and there will be plenty more to come as well. So glad to hear you enjoyed the braid and happy to hear that you’re back in the kitchen – the whole family will benefit and you’re giving life to an old love and enjoy the journey. Taco braid has no oven temp listed. Josie, you want to preheat your oven to 375 degrees F. It’s listed at the beginning of the recipe instructions. The video is awesome and so is the recipe! This is soooo good! I just made it and my husband and I are enjoying it right now. A big hit with us both! Thanks for sharing the recipe!! I’m SO happy to hear that! Thanks so much for letting me know. It’s a good thing when a recipe comes along that everyone enjoys equally – a new menu item! This is one sensational recipe, making this one soon. Thanks so much, Laureen! Enjoy it. 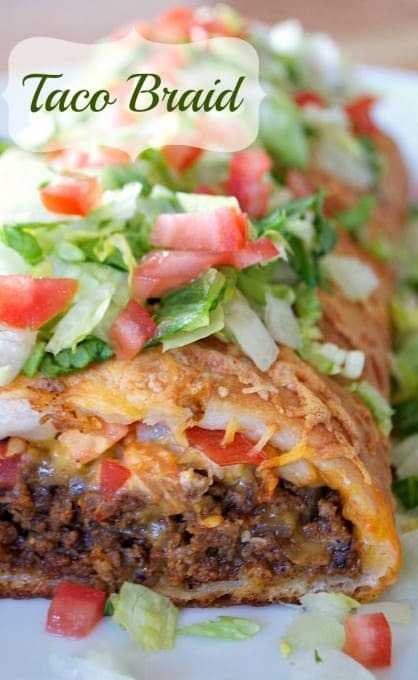 Taco Tuesdays just got kicked up a few notches! Love this! Totally drooling over here! This is a great dinner or party idea! This would be a great super bowl meal – love the flavors! Thanks, Denise! It is perfect to feed those hungry football crowds! 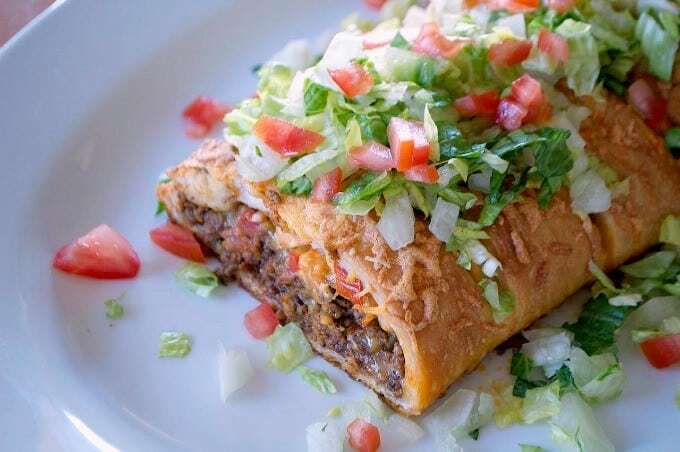 Lynne, I have been making taco braid for years. I have always made it with homemade bread and it is wonderful. Using pizza dough sounds very convenient. I will give it a try!! Thanks, Andrea! I love using homemade dough as well. The use of the pre-made pizza dough makes it great when you’re pressed for time. I was wondering if the canister of refrigerated pizza dough is the same as the biscuit style tube that is by the biscuits? Thanks! It is in the same kind of canister, Kathy. I’ve also found balls of refrigerated pizza dough at my grocery store, but I find it easiest to use the kind in the canister as it’s already rectangular in shape and doesn’t take much more effort to make it larger. I always crockpot a roast with taco seasoning. I can’t stand cilantro but I know a friend uses it when cooking the meat. Those who love cilantro swear by this. I shred the cooked roast, then place that meat in a fry pay with a jar of salsa until the liquid is reduced and that is the filling I use. It is so much better than hamburger beef. That’s a great idea, Brenda! I’ll have to try that next time. You aren’t alone in your distaste for cilantro. My daughter can’t stand it and neither can my husband. This was delicious. I put a layer of cheese, the taco meatwith onion, another layer of cheese and then braided. Spread melted butter on top and cheese, Baked for 25 minutes and then cut into 8 pieces. Served with lettuce, tomato, sour cream, and taco sauce. My family all wanted more. The only issue I had was that I didn’t have parchment paper so I used waxed paper, it stuck and I had to peel off paper from the entire bottom, maybe if I would have sprayed it with Pam it wouldn’t have stuck. Sounds great, Melissa! Thanks for letting me know. Yes, I would definitely use the parchment next time or if you don’t have that, go with some tin foil – less likely those will stick. Stumbled across your site and had to try this taco braid! 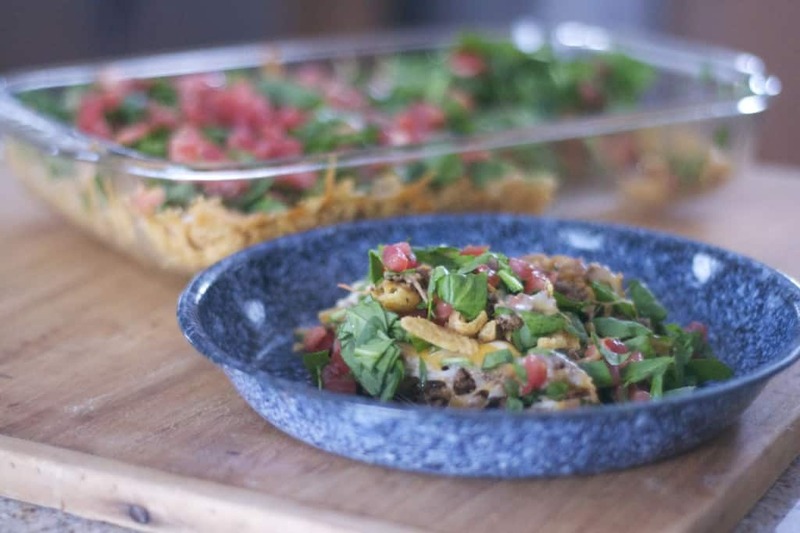 A HUGE hit with my boys – this will become one of our ‘go-to’ meals. I too used canned tomato but drained it first. Next time, I’ll put a fine layer of salsa under the diced tomato for a little more kick. That’s so awesome to hear, Shelagh! Thanks for letting me know. I love the additions you made to it as well. I’ve made the Denver Scrambled Braid here on the blog and I’ve got more braid recipes in the works, so be watching for them! Thanks so much, Megan! Can’t have a Taco without the veggies, right? I have everything but the pizza dough stocked right now, although I do have the refrigerated pie crusts. Any ideas on the substitute? Am thinking of trying it for a quick lunch on this rainy day. Here’s a link to kind of give you an idea of how you’d make it. Enjoy it! I just made this and it’s baking now. I’m sure it will taste yummy, but I must say, the dough was a bear to work with. It was darn near impossible to use a rolling pin to roll it out, it kept sliding all over. It made me frustrated. The dough is so flimsy to start with, and then to try and shape it, was not easy. It stuck to the parchment paper. I even used a little flour. It looks pretty in the oven and it smells good. I just wish the dough didn’t have to be such a pain. Any suggestions if I try this recipe again? I’m sorry, Kim. I’ve had that issue many times as well. The dough is so good at retreating back to its’ original form after you think you’ve rolled it. It’s like one step forward and two steps back. Thank you, very much for letting me know, Donna I appreciate it! Made this tonight, added refried beans under taco meat, added a can of green chilies and fresh diced jalapeño and onion to taco meat! Was awesome thank you for the great idea for dinner! Yay, Amy!! I’m so glad you liked it and great idea for the substitutions. It sounds delicious! Five of the six most poisonous critters live around here and I’m terrifed of all of them so I spend very little time outside. Aside from the rattler’s tell, they all have a vile odor they put out when threatened so if you’re going to be working in flower beds sniff around first. Should dogs or cats get bitten get them to the vet ASAP, they can survive after massive doses of anti-biotics. Tacooooss! Another recipe worth trying! Thanks for sharing this!